Thanksgiving will be here next week, and while preparing for the holiday, it’s a good opportunity to encourage children to take time and reflect on all the people and things for which they are thankful, from their friends and teachers to pumpkin pie and picture books. Try one of these fun and creative “I’m Thankful For…” Thanksgiving activities with your kids to get in the holiday spirit. Poetry can be the perfect medium for expressing gratitude; it is flexible, imaginative and has the ability to be funny, touching, playful or silly (or a combination of all of the above). Start off by getting inspired by checking out these poetry games and activities. In a Frecklebox journal, brainstorm all the different people for whom you are thankful—your parents, siblings, best friends, teachers and coaches. Now write down all the places and things that come to mind when you think of being thankful. Your list can be a mix of anything that is important to you – playing basketball, fall leaves, blue skies, trips to the library, family vacations. Read over all the words you’ve written down in your journal and use some or all of them to write a poem about why you are thankful. Don’t worry about rhyming if you don’t want to – just have fun with it and express how you feel. 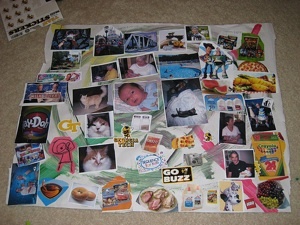 If you believe a picture is worth 1,000 words, take on a visual project and create an placemat collage for Thanksgiving. Take out a large sheet of construction paper, scissors, a glue stick and a stack of magazines and photos you don’t mind cutting up. Think about why you are grateful, and cut out pictures that represent these people and things. Glue them to the construction paper in a collage and laminate using clear contact paper. Use your placemat while you enjoy Thanksgiving dinner. Write thank-you cards, draw pictures or bake cookies for the people who have made a difference in your life this year. A simple “thank you” will mean the world to them. What are your favorite family Thanksgiving activities? Share in the comments!